If you’re on a quest for younger-looking, smoother, and more even-toned skin, you may have heard of alpha hydroxy acid (AHA). But what is an AHA? Given there’s more than one AHA, which alpha hydroxy acid product should you use? Consider this your cheat sheet on all things AHA—you’ll finally know how AHAs work and the differences between them! Alpha hydroxy acids are a group of natural and synthetic ingredients that, when properly formulated, can exfoliate the uppermost layers of skin. Doing so reveals fresher, refined skin that appears much smoother, is more hydrated, and, over time, becomes visibly firmer. Anyone concerned with looking younger, longer should consider adding an alpha hydroxy product to their skincare routine. Among all of the alpha hydroxy acids, glycolic acid is the gold standard. That’s because it’s the most researched and, along with lactic acid, has the best track record of impressive results for all ages and all skin types. What makes glycolic acid so special is its size and ability to penetrate the uppermost layers of built-up skin to reveal the better-looking skin hiding beneath. It also has a natural ability to hydrate skin, “teaching” it to become better at retaining its natural moisture. If that weren’t enough, glycolic acid used alone or with other AHAs at concentrations of 5% and up help enhance skin’s look of firmness and resilience while softening other signs of sun damage. Although glycolic acid can be derived from sugarcane, the synthetic form is the one most often used in skincare products because it’s easier to stabilize. 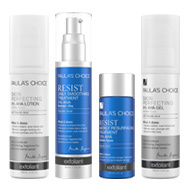 Paula’s Choice offers several AHA exfoliants with glycolic acid. Lactic acid does everything glycolic acid does, but just a bit slower because it’s a little bit larger, which slightly reduces its ability to penetrate skin’s outermost layer. Topical lactic acid in concentrations of 2% and up can hydrate skin; when used alone or with other AHAs, it begins working as an exfoliant at a 5% concentration, with amounts between 5% and 10% considered ideal for skincare products meant to exfoliate. Although lactic acid can be derived from milk, the synthetic form is used most often in skincare products because it’s easier to stabilize and ensure consistent results. This AHA can be derived from apples or produced synthetically; the synthetic version is the popular choice for skincare for the same reasons mentioned above for glycolic and lactic acids. Malic acid is larger than glycolic and lactic acids, but is still able to exfoliate, and it also delivers antioxidant benefits. Malic acid in concentrations of 1% to 2% is a good supporting player when included in AHA exfoliants led by glycolic and lactic acids—you get a nice multi-level exfoliation. It’s typically not used alone as it’s not considered as effective as glycolic or lactic acids. Tartaric acid is larger in size than malic acid and is nearly twice as large as glycolic acid. It occurs naturally in grapes (and, it follows, in red wine), but is also made synthetically, which is the form typically used in skincare products. Although tartaric acid can exfoliate skin when used in roughly the same concentrations as glycolic or lactic acids, it functions best in helping to maintain the pH range that other AHAs need to work their magic. In certain formulas, it helps provide more targeted exfoliation, as each size of AHA has its layer-by-layer benefits. Citric acid comes from various citrus fruits but also can be made synthetically. Although in higher concentrations (around 10% and up) it can exfoliate skin, it’s also considered more irritating due to its naturally lower and skin-sensitizing pH of 2.2. Low amounts of citric acid show up in many skincare products where it works as an antioxidant as well as a pH adjuster, keeping formulas within the pH range they need to be effective yet gentle. Some AHA products contain citrus extracts that the brand claims work like natural AHAs. That sounds good, but published research hasn’t proven such extracts are useful to exfoliate skin. This AHA isn’t as widely used as other AHAs because there isn’t as much research supporting its use. But, mandelic acid shouldn’t be overlooked; its larger size—it’s the biggest AHA—means slower penetration into skin, making it an intriguing choice for sensitive skin. Research has also shown that mandelic acid can prompt skin to make more oil—not great news for oily or breakout-prone skin, but helpful for those with dry skin. Concentration ranges haven’t been specified for mandelic acid in skincare products. Research on using it as a peel and for other purposes has involved concentrations between 20% and 40%, amounts we’ve never seen in skincare products.